Kliknij na zdjęcie i przejrzyj wszystkie dostępne zdjęcia do Pousada Paraty. wspólna kuchnia, wspólny salon / sala TV, codzienne sprzątanie, pokoje rodzinne, część przeznaczona dla palących. American Express, Visa, Euro/Mastercard, Hipercard. Situated in Paraty, in a building dating from 2010, 4 km from Paraty Bus station, Pousada Paraty features a shared lounge and guestrooms with free WiFi. 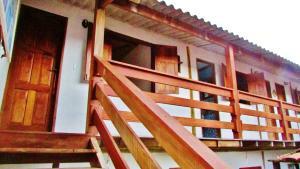 The property is around 4.1 km from Paraty Historic Centre, 3.8 km from Santa Rita church and 3.9 km from Puppet Theatre. Our Lady of Rosary church is 4 km from the property. At the guest house, every room has a patio. The private bathroom is fitted with a shower. Guests at Pousada Paraty can enjoy a continental breakfast. Chapel of Our Lady of Sorrows is 4.2 km from the accommodation, while Pontal Beach is 4.3 km away. Please note, late check out is available for an extra fee depending on availability. Payment before arrival via bank transfer is required. The property will contact you after you book to provide instructions. Parking is subject to availability due to limited spaces. This property will not accommodate hen, stag or similar parties.